Want to add your OwnerRez widgets to your Facebook page? We've had several requests for this, but we don't have our own Facebook app yet. Now you can, courtesy of the Thunderpenny Static Html app. 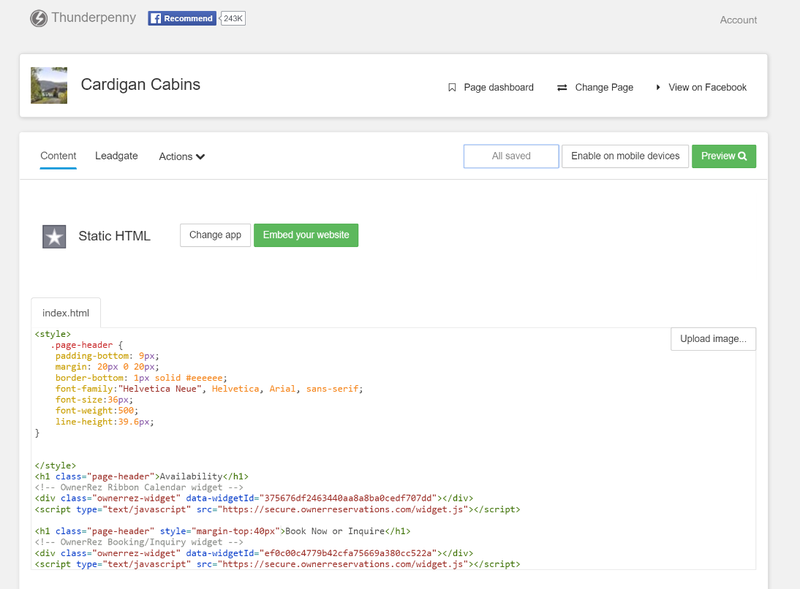 One of our sharp-eyed users turned me on to this method -- Victoria over at Smoky Mountains Vacation Cabins. NOTE: this post has been turned into an article in our support section: Adding OwnerRez widgets to Facebook -- that article will be updated with any changes to this process. 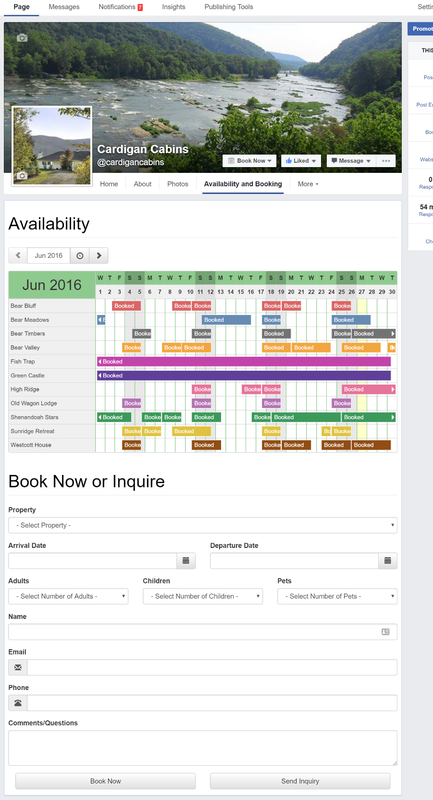 This technique doesn't require an OwnerRez Facebook app, but instead lets you embed your vacation rental calendar and book now widgets from OwnerRez into Facebook directly. Here's what to do. First, go to https://www.facebook.com/StaticHtmlThunderpenny/. That's where the Static Html app is hosted. To install it, hit the Use App button. Select the app for your property or company. 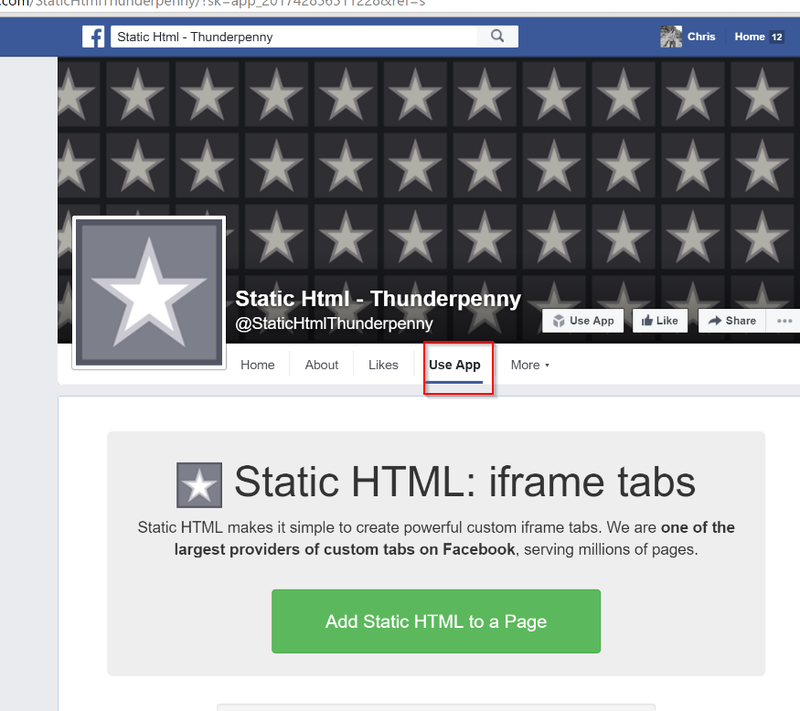 Once you've got the tab set up on your Facebook Page, copy/paste the widget HTML from OwnerRez. If you have existing widgets, you can use them, or create a new one just for Facebook under Settings > Widgets in your OwnerRez account. If you want to learn more about OwnerRez widgets, check out our widget how-to article. If you've got separate Facebook pages for each property, use the three month calendar widget and a book now widget for each one. If you've got one Facebook page for multiple properties (like this example), create a new book now widget with Show Property Dropdown selected (so guests can pick the property), and use the ribbon calendar widget. Create a new listing site in OwnerRez and set that listing site on the new book now widget so you can track that the inquiries/bookings are coming from Facebook. Excellent write up! Just note that tabs are not visible in Mobile, but thunderpenny provided a mobile link which you can post for your mobile Facebook page visitors. Where would I find the widget HTML from OwnerRez? Oh, great point! I sort of glossed over that part in the post didn't I. You can create widgets in your OwnerRez account under Settings > Widgets. Yes, this is an option on the standard Book Now/Inquiry widget. Create a new Book Now/Inquiry widget. When you go to change the settings on the widget, look for the "Show Property Selector" checkbox under the Fields section (up near the top). If you enable that option on the widget, it'll turn on the property dropdown like I show in my example.